Working in a machine shop can be a rewarding job. The satisfaction of seeing parts come to life from raw material is not something that everybody can experience. To create a part that is up to spec, machinists often have to deal with a less pleasant side of the job: math. Although math is a fundamental aspect of any work that requires precision, dealing with numbers and calculations can be intimidating. 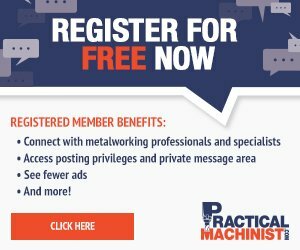 Luckily, there’s no lack of resources and tools that will help you get more familiar with basic mathematical equations that you will encounter during your career in a machine shop. We did some research, collected information on how other machinists deal with machine shop math problems, and gathered a list of the best instruments, textbooks, and apps that will help you to master the subject. If you want to successfully tackle a math problem, you’ll probably want to start by getting a good, powerful calculator. It might sound like a redundant suggestion, but many people often underestimate the importance of investing in a good calculator. We recommend using a machinist calculator as it already has machining-specific keys, like surface feet per minute, inch per tooth, inch per minute, and data about the most popular materials. Here’s a good reference book that provides tables, charts, and formulas used by machinists, engineers, designers, and toolmakers, featuring coverage of drills, tapers, screws, gears, weights, tool steels, and shop prints. This book was written for students and includes a review of basic math operations (whole numbers, fractions, decimals, percentages), measurements, and additional topics that are directly applicable to machining and manufacturing. This comprehensive book combines math concepts with relevant machine applications through industry-specific examples and realistic illustrations. A major, indispensable reference guide jam-packed with hard-to-find calculations, formulas, and tables. Here’s a book that focuses more on mechanical work. This is a great book if you want to improve your math skills, as it is renowned for its ability to duplicate, as much as possible, personal instruction. This book covers the fundamental concepts of math, from arithmetic to trigonometry, that professionals in different trades need to be familiar with. It includes plenty of exercises coded by trade area. A great book for machinists entering the trade or trying to improve or refresh their math skills. The two volumes, divided by difficulty level, include plenty of good examples and exercises. The availability of machinist apps is potentially endless and finding those apps generally depends on your smartphone OS. Many machine tool manufacturers offer a good selection of apps that will help you deal with issues related to their specific brand.